"Imprisoned in an Luminous Glare: Photography and the African-American Freedom Struggle"
Leigh Raiford, Ph.D, is Associate Professor of African American Studies at the Univeristy of California at Berkeley. She earned a BA in African American Studies and Women's Studies from Wesleyan University and received her doctorate in African American Studies and American Studies from Yale University in 2003. Before coming to UC Berkeley in 2004, she was the Woodrow Wilson Postdoctoral Fellow at the John Hope Franklin Humanities Institute at Duke University. Her teaching and research interests include race, gender and visual culture with an emphasis on film and photography; race and racial formations of the United States; black feminism; memory studies; and black popular culture. 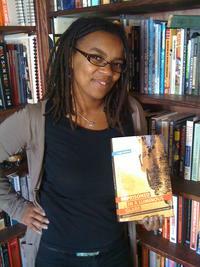 Raiford is co-editor with Renee Romano of The Civil Rights Movement in American Memory (University of Georgia Press, 2006). Her work has also appeared in American Quarterly, NKA: Journal of Contemporary African Art, English Language Notes and in the Coco Fusco/Brian Wallis edited collection Only Skin Deep: Changing Visions of the American Self, (Harry N. Abrams Press, 2003). Raiford is currently completing a manuscript entitled Imprisoned in a Luminous Glare: Photography and the African American Freedom Struggle.